For today’s homify 360° discovery, we travel northwards of Calgary, which is located in the Canadian province of Alberta. Here is where a small 2-hectare plot of land showcases a comfortably and stylish family home that focuses on basics and using its design to make it fit for a family. To inspire our country-style lovers, this home has a touch of country and craftsman design elements. The creative professionals over at Drafting Your Design helped create interiors perfect for a busy family who loves to entertain. Looking at its exterior façade, we can see that the home has a light touch of the country style. At the entrance of the home, rock has been used to raise up the front terrace. 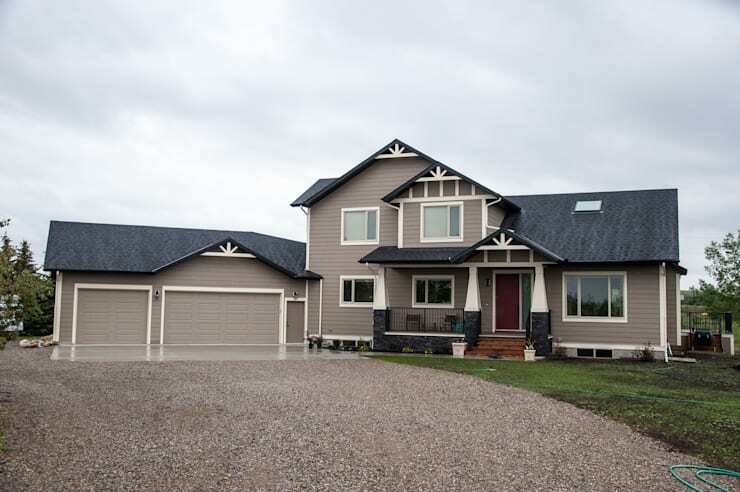 The timber siding is a soft shade of beige and the decorative white trim highlights the country design. A three-car garage, which sits next to the house, completes the functionality factor. 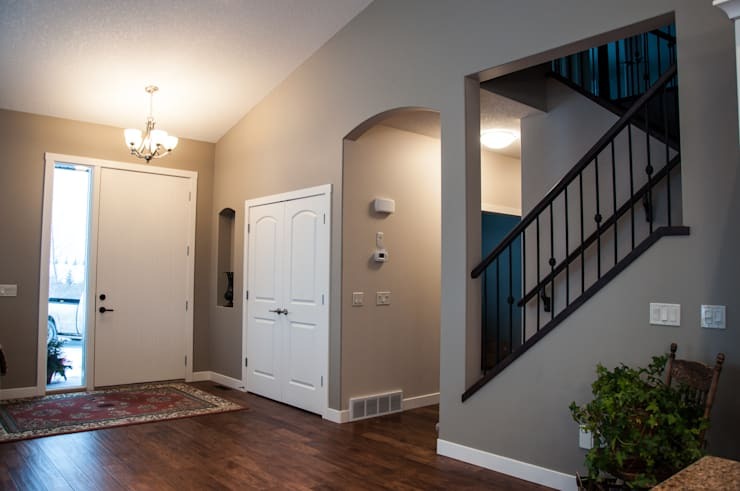 Every home should have a warm and homey entryway – just like this one. Notice how the slope of the roof creates a sense of intimacy in this foyer. From here, the residents can access the garage and the stairs quite easily, while this space also opens up onto the main floor of the house. Rich hardwood floors and a classic iron railing on the stairs create a refined folk style. 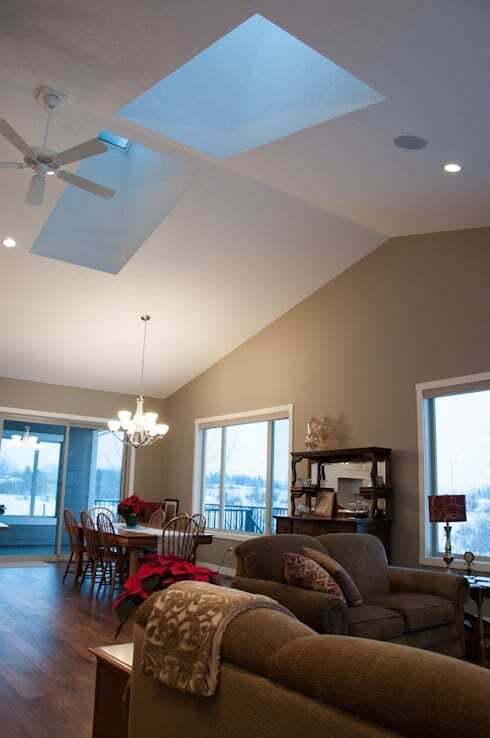 We just love how the vaulted ceiling creates a sense of openness inside the house, with twin skylights beautifully illuminating the indoors. In addition, ample windows also help to bring in natural light and garden views. The art-and-craft style of the wooden furniture brings more country style into the home. And we especially love corner-window ambience that is enjoyed by the dining area. It is our opinion that this super stylish kitchen is the main star of the interiors. Just have a look at the oversized island in the centre. 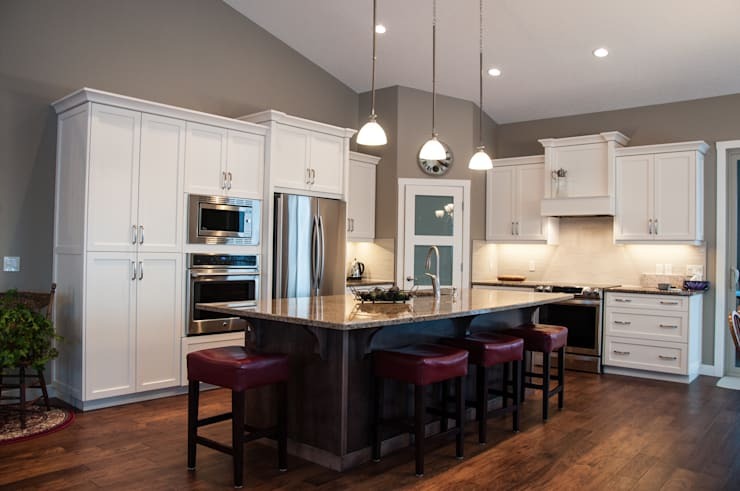 It’s a great place to entertain and provides lots of extra counter space. Bright white cabinets paired with gleaming stainless steel appliances make the kitchen seem more modern, while ruby-red stools around the island ensure a touch of colour and comfort. The perfect space to enjoy everything from your morning coffee to your evening glass of wine, don’t you think? 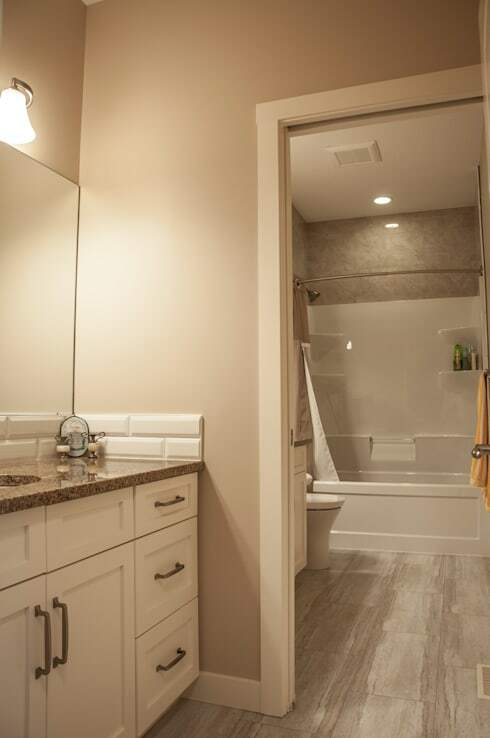 How perfect for a family, with a doorway separating the two halves of the bathroom space, conveniently allowing one member to shower while another gets busy with brushing and flossing. And don’t you just love how the stunning stone tiles bring some unexpected charm to the design? 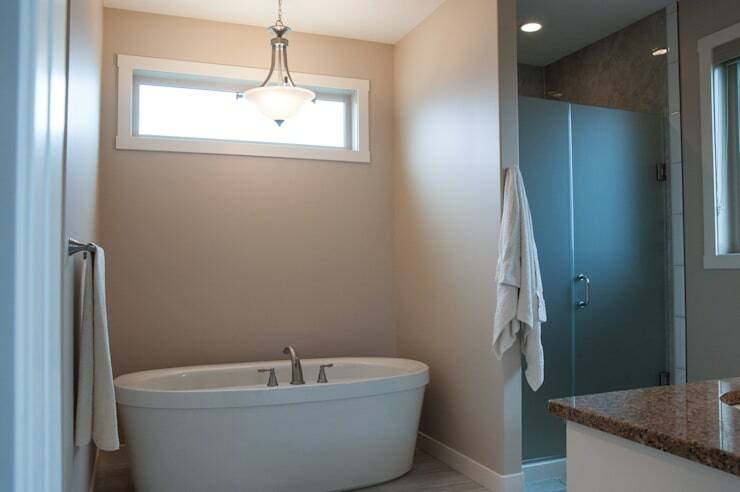 For the master bedroom’s en-suite, we get a freestanding bathtub with a separate shower. A clerestory window up high brings in a patch of lighting while also maintaining some privacy. 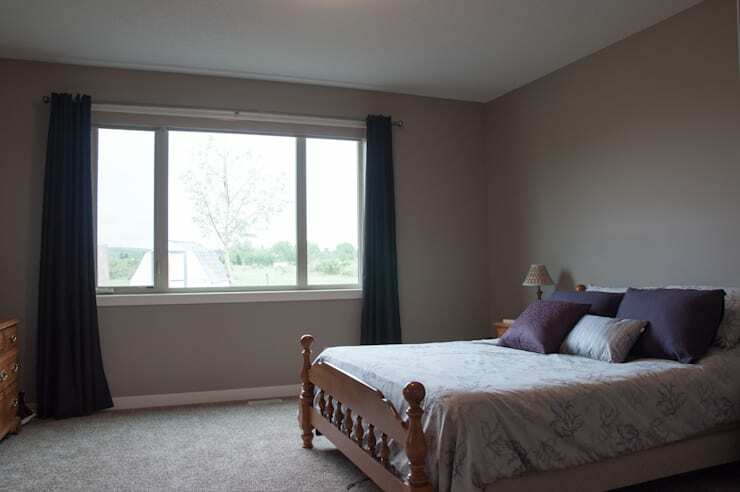 The master bedroom is located on the main floor of the house. With east-facing windows, an idyllic view of the countryside hills comes seeping inside. Simple furnishings and a wash of natural light means that this bedroom is a quiet retreat for relaxing and recharging. Bespoke wooden furniture keeps the country theme alive while the creamy walls ensure a touch of classic elegance. A delightful old-school house which still manages to provide a firm dose of comfort and beauty! Want to sleep in style? See these 10 ways to make your bedroom look like a hotel.